The Hurricanes’ embarrassing 59-21 loss to No. 23 University of North Carolina (UNC) was a brutal learning experience. The blowout put Miami’s dreams of an ACC Coastal title to rest and handed the team its first defeat under Interim Head Coach Larry Scott. Much like the game against Clemson three weeks ago, the Tar Heels got off to a fast start while the Hurricanes came out completely flat. To put it bluntly, Miami (6-4, 3-3) was outplayed in every aspect of the game. Here are a few things we learned on Saturday. The Tar Heels certainly deserved to win the game on Saturday, but if anything, the Hurricanes’ wounds were self-inflicted. Miami had three costly turnovers in the first half: the first was a fumble recovery from a bad snap that flew over sophomore quarterback Brad Kaaya’s head, the second was an interception that was returned for 60 yards deep into Miami territory and the third was a Kaaya fumble deep in UNC territory. The Tar Heels capitalized on those opportunities, scoring two touchdowns off the takeaways. 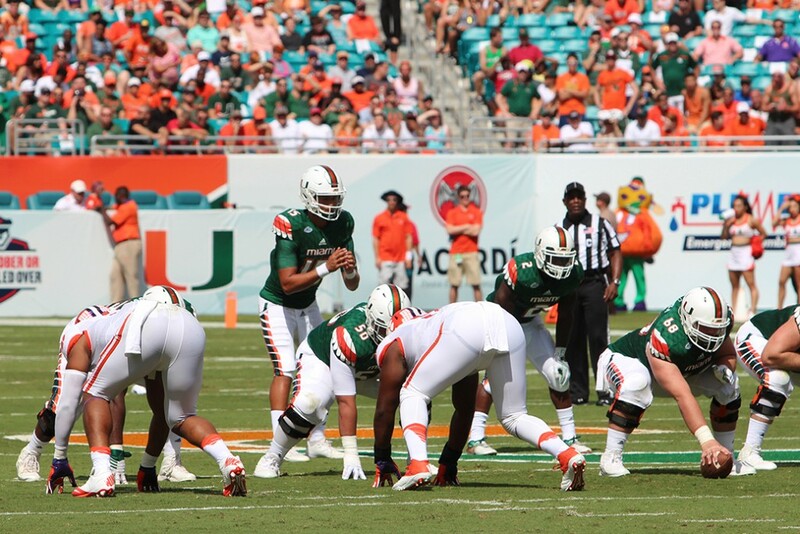 Turnovers weren’t the only problem that plagued the Hurricanes on Saturday. As a team, they were flagged 12 times for 103 yards. The negative yardage cost them field position and ruined drives. Although turnovers were not an issue earlier in the year for Miami, penalties have been a nagging problem for the Hurricanes all season, as the team leads the nation averaging 84.9 penalty yards a game. The Hurricanes knew the young offensive line was going to struggle this season with four new starters. Junior guard Danny Isidora is the only starter to return from last year’s team and the group as a whole entered the first game with 22 combined starts. The line has consistently failed to protect Kaaya or to create holes for running backs Joe Yearby and Mark Walton. Clemson only rushed two defenders on the Shaq Lawson sack that gave Kaaya a concussion three weeks ago, which resulted in redshirt freshman Malik Rosier starting against Duke. Rosier got injured in his first series against the Blue Devils and was evaluated in a Durham-area hospital after the game. Then on Saturday, Kaaya was sacked twice – one leading to a fumble – and received a high snap from sophomore center Nick Linder that North Carolina recovered. Kaaya and Yearby have still had solid seasons, but the offensive line needs to improve for the offense to fire on all cylinders. Much like the Clemson game showed the nation that the Tigers – now the consensus No. 1 ranked team – were playoff contenders, North Carolina’s drubbing of Miami proved that the Tar Heels are an elite team. North Carolina (9-1, 6-0) can even be a dark-horse candidate for a playoff spot if the team takes down Clemson in the ACC Championship. They have a complete roster full of talent and experience. Offensively, senior quarterback Marquise Williams can make plays and has a stable of skilled players to distribute the ball to.